As we head into our rainy season, let’s remember how comfortable we are that we have so many kinds of roofing over our heads. It’s nice to nestle in when the wind gets up, but when you do need to brave the cold and rain, pause for a moment and look up! We are surrounded by the well thought out beauty and architectural styles of the roofs in our area. From basic wood and shingle patterns, reclaimed and imported tile, to slate and industrial corrugated steel looks – roofs are interesting and add unique elegance to homes all over the Peninsula. Below is some general information about a few of the styles we see here. 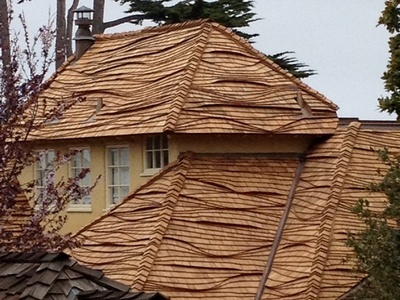 Wood shingles on their own give a warm, comfortable look to a home and age beautifully. They don’t need to be in symmetric rows; shingles can be staggered to form interesting patterns. They come in square ends, round ends or notched to create unique style. An additional design option for shingles is called a “Cotswold Style”. In this style each shingle is cut and perfectly placed in a way that forms a flowing, up and down, fluid look, also known as a wave pattern. On select homes you’ll find an architecturally interesting feature which is called “rolled eaves”. This might remind you of the typical fairytale cottage in the woods. The design requires a high level of roofing expertise and skill. Each individual shingle is steam heated perfectly so it can be wrapped and nailed into the pattern. It takes skilled roofers with years of experience to be able to perform these kinds of detailed roofing work. Although some folks are skittish to install this kind of roof, these roofs are treated and carry a Class A fire rating. Heavy shake is another warm, cozy feeling kind of roof that is quite popular on the Peninsula and ubiquitous in the city of Carmel-by-the-Sea. Most shake comes from British Columbia where western red cedar is sawed in blocks and then hand split in most cases to create that rough edged, heavy look. It is a completely green product, ages beautifully, and lasts for decades. Sound, sustainable logging practices ensure we will have this resource available to us for generations. Do not be afraid of fire danger with this material – these roofs are treated and carry a Class A fire rating. 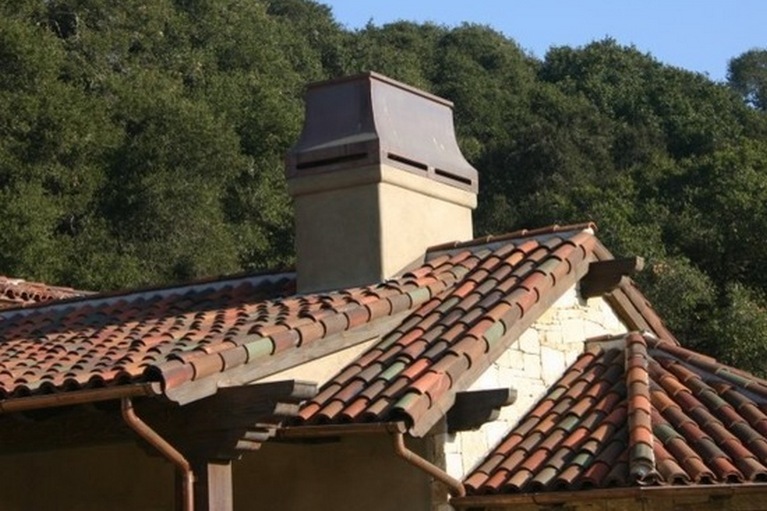 Inspired by the missions of California, clay tile is a staple in the California landscape and these roofs can last 100 years. With tile, you can use different colored pieces to create a patterned roof with unique character and charm. Colors range from your typical terra cotta to dark browns and light peach. Different textures are available as well to add visual differentiation, which makes these tiles a great option. Vintage reclaimed and imported Italian and French tile is also available for those folks who want a truly authentic look. Of the various kinds of roofing, standing seam is usually reminiscent of commercial buildings or ski lodges in Tahoe. It has gained popularity in our area because it finishes a modern style home with class. 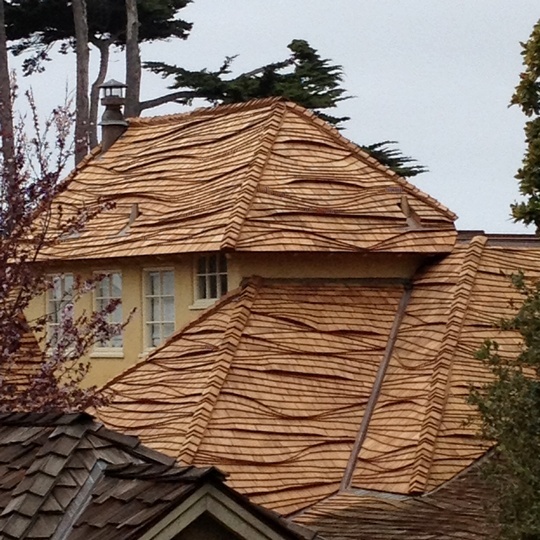 These roofs are found in Big Sur, Carmel Highlands, and scattered throughout our cluster of towns here on the coast. They are fireproof and offer superior protection against the elements. They have low maintenance, a distinctive architectural look, long life cycles, and are 100% recyclable. Composition shingles have come so far over the years! They have increased in decorative value while maintaining a cost that is not out of this world. The usual “three tab” thin shingled grey roof has transformed to include many styles of dimensional design with thickness options that create the look of slate, shake and wood shingles. These roofs can also carry a 50-year warranty, are extremely strong and are Class A fire safe. There is plenty to think about when considering a new roof. Finding the right roofer is important – when reading your roofing contract, consider what is included. Many roofers do not include plywood in their contracts. Older homes were built with skip sheathing (the boards are spaced where the shingles are nailed in). Solid plywood sheathing is now a requirement for most warranties. Are you wondering why one contract is thousands less than another? Check to see that plywood and sheet metal are included. Will the sheet metal and pipe flashings be painted? Unpainted metal will rust away quickly in our foggy, marine climate. A quality underlayment is imperative. The contract needs to specify what that is and how it relates to the overall warranty. Roofing is not a collection of random parts – it is a true system that protects you and your home from the elements. Be sure your contract states that the warranty is for both materials and workmanship. If workmanship is not covered and you ever have an issue with the roofing material, only the material is warrantied. They may deliver a stack of shingles to your door. You will still need to pay an installer to do the replacement work. I hope this piece was informative. It may give you a little incentive to look more closely at the architecture and roof lines of our community. As the winter storms come and go, we’ll all be safe and happily snuggled up under the protection of our own.